According to a recent study, sports fans are consuming news and highlights through social media and mobile devices more than ever. The sports media group Perform surveyed more than 1,000 adult American sports fans during February and March and found that 26 percent of sports fans use social media to follow leagues, teams, and players. That number has grown significantly over the past year. During a similar study performed in 2011, only 15 percent of sports fans tuned in through social media channels. Of those surveyed, 22 percent said they turn to their mobile devices to get breaking news — in 2011, only 13 percent of sports fans utilized their phones for this purpose. 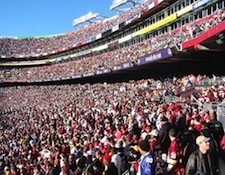 While 51 percent of fans follow teams and leagues, 46 percent follow individual players. Additionally, 48 percent use social media to access video highlights and written articles, and 35 percent tune in to news bits or interviews. Surprisingly, only 33 percent of fans use Twitter to stay informed about their favorite sports teams. Eighty-nine percent of fans favor Facebook and 65 percent use YouTube. Showing some promise for the sports niche, 18 percent of those surveyed said they use Google+ to stay updated. Whether you’re a coach, player, or fan, social media is growing as an important resource for sporting events. If you don’t already have a presence on the social networks mentioned above, you could be missing out on a valuable opportunity.